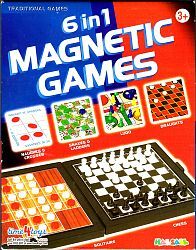 6-in-1 magnetic travel games : naughts and crosses, chess, draughts, ludo, solitaire, snakes and ladders. All the pieces are stored within the game case, which includes the boards. A neat and handy way to travel with 6 popular family games.